This neat little mic is incredibly versatile - and it sounds a lot more expensive than it actually is. 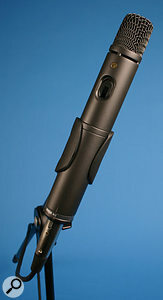 Rode have been in the electronics business in Australia since the late 1960s, but the company became better known around the world after 1998, when they started producing a cost-effective range of microphones. Over the last decade or so Rode have rewritten the book when it comes to the cost and performance of studio microphones, and there can be few project studios without at least one Rode mic in their collection. The latest offering is a new multi-purpose electret cardioid design, called the M3 — essentially a cardioid electret version of the now-discontinued hypercardioid NT3 (which had a true capacitor capsule). The M3 is supplied in a surprisingly large, but sturdy, plastic carry case, complete with a substantial stand clip adaptor and a foam windshield — and a 10-year guarantee! The polar response is a tidy end-fire fixed-cardioid pattern, and the mic is intended for general-purpose applications, both on stage and in the studio, where its wide bandwidth and flexible powering options make it supremely versatile. The back-electret capsule doesn't require power, but the internal impedance converter can be driven from standard phantom power or an internal 9V PP3 battery. It will tolerate phantom power between 24 and 48V quite happily, and the battery is not used if phantom power is detected on the connecting cable. The first thing to strike you about the M3 is its length. The mic measures 225mm long (nearly nine inches) and is 33mm in diameter (just over an inch), which is longer than most, although slightly shorter than the NT3. The mic weighs 390g and the body is painted in a non-reflective satin grey finish, with the top 35mm being a heavy-gauge wire mesh over foam to protect the capsule. The standard Rode 'gold blob' is present on the top side of the mic body, but unlike Rode's larger side-address mics it doesn't indicate the capsule axis: this is definitely a traditional end-fire mic, and you point it at the thing you want to hear! A recessed, three-position slide switch and associated red LED are placed below the gold dot, but there are no markings at all. In fact, the bottom position switches the mic off if you are using the internal battery option, and mutes the mic's output if it is being phantom-powered. When the switch is moved out of this lowest position, the LED flashes briefly to indicate good battery condition (if in use), or comes on permanently if the battery voltage is getting low. The only way to check whether phantom power is present is to unplug and replug the cable, which will cause the LED to flash. The middle switch position selects the normal operating mode, while the top position introduces a second-order (12dB/octave) high-pass filter, turning over at 80Hz, to remove rumbles and handling noise or to help thin out a bass-heavy source. These are useful facilities, but it is madness not to have any markings at all. 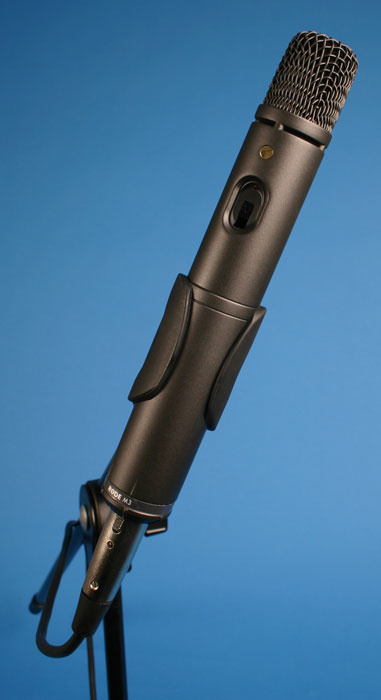 The lower half of the mic body can be unscrewed to access the internal battery compartment, and doing so also reveals the strength of the metal body. This is clearly a mic designed to withstand a lifetime of abuse. The battery compartment is clearly marked for correct orientation, and a curved plastic clip holds the battery securely in place when the mic body is screwed back on. The specifications claim more than 200 hours of use with an alkaline battery, which would equate to roughly six months of gigging twice a week. Hidden away just above the battery compartment inside the mic is another three-position slide switch. The good news is that this one is labelled. The bad news is that you can't adjust it with your fingers — you'll need a small screwdriver or pen. This switch introduces a pad between the capsule and impedance converter, offering 0, 10, or 20dB of attenuation, which means that the mic can be used very close to very loud sources. The technical specifications are good for this kind of mic at this kind of price. The frequency response is given as 40Hz to 20kHz, and the accompanying frequency response chart suggests a gentle roll-off at the bottom, roughly 3dB down at 100Hz and -10dB by 40Hz. It is substantially flat between 100Hz and 4kHz, above which there are a couple of mild 2dB peaks before a smooth high-end roll-off to -3dB at 20kHz. This is an impressively flat and extended response, especially compared with AKG's C1000S (probably the closest comparable mic), or any similarly-priced moving coil (dynamic) microphone. The self-noise figure is given as 21dBA, which is identical to the C1000S and good for a 0.75-inch electret design (the NT3 has a figure of 16dBA). The sensitivity is a little low, at 6.3mV/Pa, compared with most studio capacitor mics (although fractionally higher than the C1000S), but I doubt it will cause any problems in typical close-miking applications in project and home studios, or on stage. The maximum SPL is given as 142dB for one percent distortion (5dB better than the AKG mic). The M3 should be able to cope with close vocals, electric instrument amps, and even drum and overhead duties, without cracking up. The M3 feels robust, and the supplied stand adaptor looks unbreakable. I ran the mic on phantom, from an installed battery, and with phantom when the battery was installed... and it worked perfectly on each occasion. I couldn't test battery life as such, but I inserted a partly used PP3 and it was still going happily after being left on for the best part of a week. The mic sounds full and smooth when used for close vocals, with a modest airy lift at the high end. To be honest, it sounds considerably more expensive than it actually is — a fairly common theme with Rode mics! OK, so it won't cut through on stage like a Shure SM58 will (it doesn't have that classic projection) and unless the filter is switched in it can sound rather too full at times, but in the studio that smoothness is a bonus. In fact, the response seems smoother than the Rode NT5 through the presence region, and only slightly less full at the bottom end. On acoustic instruments the M3 works very well indeed, turning in nice results on acoustic guitars and clarinet, both tracks needing almost nothing in the way of EQ at the mixing stage, which I took as a good sign. The high-end resonances inherent in most electrostatic mics are well tamed in the M3, yet it still captures lots of transient detail and clarity. The M3 is an obvious contender for drum overheads, given the extended high end, and it does indeed work very well, producing smooth, sizzling cymbals without the aggressive edge of some mics. It can also work surprisingly well as a close drum mic, even on the snare. With the 20dB pad switched in I had no problems with overload distortion when mounted right above the snare, and the sound was full-bodied with plenty of snare crack and detail. Fortunately, my drummer had a good aim, but I'm sure the mic would survive close encounters of the sticky kind, given the chunky metal construction. However, the length of the mic makes it awkward to install above the snare, and it is almost impossible to aim the rear null towards the hi-hats. The polar pattern seemed fairly tight and well controlled across most of the frequency range — a good result for a mic at this price — and that should allow use as a coincident or spaced stereo pair, perhaps above drums or on pianos. However, I wouldn't recommend using M3s for distant stereo miking, as I think the self-noise and low output would result in a relatively noisy recording. For example, my favourite Sennheiser MKH40s (that I use regularly for distant miking) have a self-noise figure that is 9dB lower, and an output level which is 12dB higher. But then they also cost about 24dB more.... It's a case of horses for courses, and the M3 is exceptionally good for the price, easily matching or exceeding the specs and performance of its nearest competitors. As mentioned above, the most obvious equivalent is the AKG C1000S, compared with which the Rode M3 has a smoother, wider bandwidth, greater headroom, near-identical noise and sensitivity, and similarly flexible powering arrangements (although, to be fair, the AKG mic will accept phantom power down to 12V). It sounds clean, crisp, full-bodied and smooth, and can cope with pretty much anything a project studio is likely to require, from vocals to percussion to acoustic guitars to Marshall guitar amps. There are several established 'jack of all trades' microphones around that will always get the job done in a workmanlike manner. The Shure SM57, the Sennheiser MD421 and the Neumann KM184 would be the top three on my list — but the Rode M3 could become another: it is that impressive. And it would certainly be an ideal first microphone for anyone setting up a new project studio on a tight budget, but with the need to record a wide range of sources in reasonable quality. The most obvious contender, especially given the dual powering facility, is the AKG C1000S. In comparison, the M3 sounds richer and more extended at the bottom, and less peaky and more airy at the top: it actually sounds like a much more expensive mic. The obvious moving-coil contenders at this price would be the ever-faithful Shure SM58 and AKG D3800 vocal mics. Neither offer the recording flexibility of the M3 but would be better on stage vocals. The SE Electronics Mini M1C is another possibility, with similar flexibility in terms of recording, but without the option of battery power. Extended frequency response with smooth extremes. Gentle presence peak for subtle air. Struggles to cut through on stage vocals. A well-engineered cardioid electret microphone that is capable of handling just about anything, with a remarkable degree of competence for the price. Smooth-sounding, with good extension at both ends of the spectrum, and the ability to cope with high SPLs, this is a very flexible mic, aided further by its ability to run on an internal 9V battery or phantom power.